Are you looking for a fun and unique way to entertain your corporate guests? Or maybe you want to reward your staff or team for a job well done! A clay shooting challenge is a great way of entertaining guests at the same time as introducing them to a new and exciting sport. Whether you are hosting a team bonding day, launching a new product, holding a training meeting, organising a charity day or any other event, we’re a flexible venue with plenty of facilities for your use, before enjoying a challenging and fun shooting experience. Our corporate clay shooting challenge is designed to suit all abilities, from the complete beginner to a more experienced shot. The experience includes a full safety briefing by our head coach, supervision and coaching by Southdown instructors, all the necessary PPE including eye and ear protection, a varied selection of targets, ammunition, and a range of shotguns, with smaller caliber shotguns with lower recoil. So we’ve got guns and ammunition to suit ladies, gents and youngsters*. A corporate clay-shooting day can be organised for as few as six participants up to 100 or more guests, for meetings in our dedicated room, team days or specific events. Southdown is the largest commercial shooting ground in the South East of England and is situated in the heart of the Southdown’s National Park, just North of Findon, West Sussex. 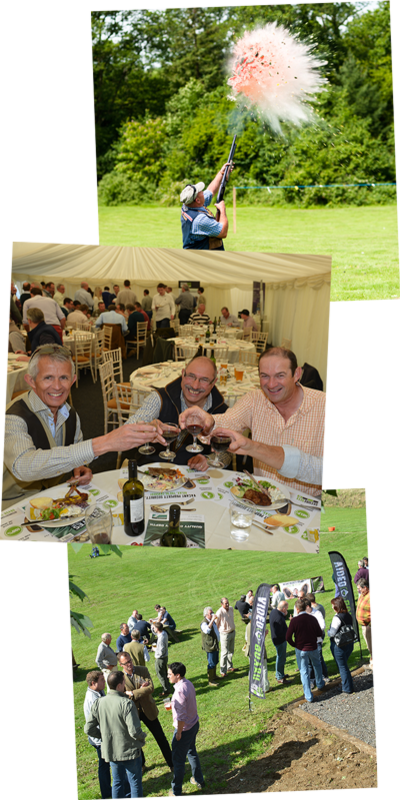 Established in 1984, Southdown is a Clay Pigeon Shooting Association Premier ground and has won the Nations Favourite Shooting Ground title for the past two years, alongside South East Favourite Shooting Ground for five years consecutively. We’re OPEN ALL YEAR ROUND so there’s plenty of opportunity to host your event. So what will the challenge involve? Your group will shoot at least 30 targets from five different shooting positions, which will include a range of aerial targets and at least one ground-based target. Scores will be recorded, and at the end of the event you can award some fun prizes for the top gun, top team or other winners…including the “save the clay” for the person who managed to let the most clays go by unbroken?! And should you need assistance, we can help you source event appropriate prizes. We have a dedicated catering team at Southdown who will work with you to create a bespoke menu for your event. Whatever your budget and requirements they will have the answer, whether it be a breakfast roll on arrival, or a full sit-down waiter service event. Our meeting room can comfortably accommodate 20-30 people and is fully equipped including IT for presentations, WiFi and refreshments (water, tea, coffee). If you hold an event at the ground this facility is part of your package, alternatively you can hire the room as a stand-alone facility. For large events we can offer marquee facilities – hire rates based on date of event, requirements and dressing. MAXIMISE YOUR DAY..Bring branding along to help promote your company, products or event. We’ve got plenty of space for flags, banners, literature etc. Want to go a step further? If you have an exhibit stand or want to bring products with you, it can be strategically placed near the clubhouse, shooting stands, in our extensive car park or if applicable, by the Marquee. We’re happy to help site promotional materials and the ground will be available to dress the day before your event. Please see below an example of a basic shooting experience including hospitality.